We hate congestion as much as you do. 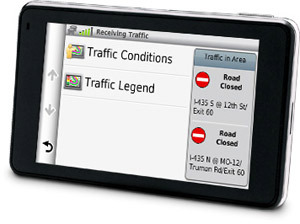 With traffic services on your navigator, you’ll avoid traffic caused by accidents, construction or other delays. Our traffic services work with your device to suggest alternate routes and guide you around trouble spots. 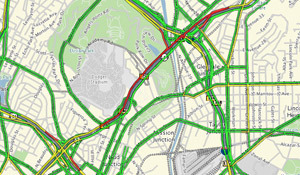 It sifts through all kinds of traffic data to find you the quickest, most hassle-free route. Automatically. So you don’t have to mess with traffic. 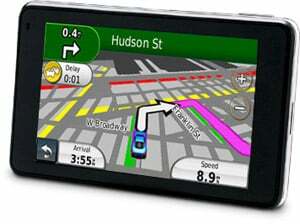 Garmin HD Digital Traffic® delivers updates as often as every 30 seconds over the HD Radio™ system. That’s up to 10 times more often than other analog traffic receivers. 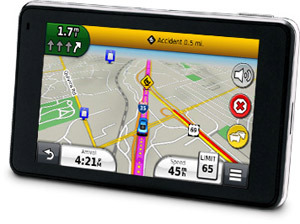 Lifetime¹ HD Digital Traffic is included with select Prestige series navigators. To get HD Digital Traffic on other compatible navigators, simply add a GTM 60 traffic receiver. Check the coverage map³ for details. With the Smartphone Link app, Live Traffic delivers up-to-date “live” traffic information to your navigator using your existing mobile data plan². Live Traffic is updated every 2 minutes and receives more than 1,000 messages every update cycle. This real-time information is available through a premium Smartphone Link subscription. Check the coverage map³ for details. Garmin Traffic delivers updates to our navigators over one of the most extensive traffic avoidance systems. The Garmin Traffic system checks traffic conditions more than 2 billion times a month to help you avoid delays due to accidents, construction or rush-hour congestion. 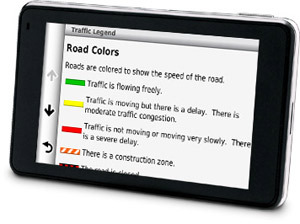 Lifetime¹ Traffic is included with select Advanced series navigators. Check the coverage map³ for details. Garmin Traffic delivers alerts about wrecks, slow downs and construction delays. It’s just like a radio traffic report, only you don’t have to wait for the radio station to air the report. Your navigator monitors traffic conditions automatically on your specific route and in your area³. A navigator with traffic services can let you know about delays on your route and suggest or automatically take alternate routes to guide you around the trouble spots. Where does the traffic data come from? Traffic data collected from more observation points, more often, helps your navigator find efficient driving routes for you. Devices with “T” in the model name include lifetime traffic. So you don't have to purchase a separate traffic receiver or traffic subscription. Just plug it in and go. To get lifetime traffic on a traffic-compatible device, simply purchase a separate traffic receiver, such as the GTM 60 HD Digital Traffic Receiver or GTM 36. Make sure your device is compatible before purchasing. Traveling to a new region? Get traffic alerts at your destination by adding a traffic service for that region (traffic receiver and corresponding map required). Traveling to Europe? You may also need an antenna extension cable. ¹Lifetime traffic extends for the useful life of your Garmin traffic receiver or as long as Garmin receives traffic data from its traffic supplier, whichever is shorter. A traffic receiver's "useful life" means the period during which the receiver (a) has the required technical capabilities to utilize current traffic data service and (b) is capable of operating as intended without major repairs. Traffic content not available in all areas. ²Contact your mobile service provider for more information about your service plan’s data and roaming rates. ³Not available in all areas. Check coverage maps for details. RDS and HD Coverage maps represent predicted RF signal density at a given location and are not intended to predict reception performance. Interference caused by geographic environment, receiver antenna type or nearby market frequencies may affect reception performance.